Let me start by saying, I’ve never been a salad person. Food has always been merely a vehicle for butter and salt. That makes baked potatoes and corn, popped or on the ear, the perfect foods. Two summers ago I discovered infused olive oils and vinegars. I hoarded my meager collection but never expanded my palate. Then Monadnock Oil and Vinegar came to town. These days I toss a poached pear, some spinach, pomegranate seeds, some slivered almonds and what ever else is hanging around into a Tupperware container. When lunch rolls around I wander the isle of the store, picking my pairing from forty choices of mixology. The pears my lovely aunt sent me at Christmas were poached in two different vinegars I had hanging around. I would love to repeat this experiment with a white ginger honey or an espresso balsamic. After poaching, I put each half pear in zip lock baggies and froze them. Whenever I want a salad, I thaw a pear, and add goat cheese or whatever. The essence of the balsamic in the pear requires just a touch of infused oil and a drop of complimentary balsamic to create a salad worthy of praise. Tonight’s salad is spinach, gorgonzola crumbled, pomegranate seeds, green onions, and yellow peppers. It’s color is bright, and I’m dressing it with lemon olive oil and dark cherry balsamic mixed about 2:1 heavy on the oil. I drizzled garlic olive oil over store-bought Italian bread, wrapped it in foil and popped it in the oven to heat. From the basket of yummy organic gifts my bosses gave me, I heated up some of Kim’s rich spaghetti sauce and boiled my angel hair pasta in lemon infused olive oil. I didn’t consciously set out to make a meatless dinner, but this was perfect. Last night I built up the coals in my fireplace and constructed a make-shift grill. I placed a rib-eye steak in a marinated of chipotle olive oil and a dash of dark chocolate balsamic. I dusted it with Jane’s Crazy Salt (I haven’t given up all my vices) and grilled it in the living room. Beyond tender, it was mouth-watering, melt-in-your mouth delicious. Fresh veggies are scarce in New Hampshire this season. The grocery is full of tasteless tomatoes from other parts of the world and tired green produce that toured the country to get here. My “green” fix will be salads and root vegetables for the next few months but with some creativity and the addition of the oils and vinegars, I won’t be lacking. 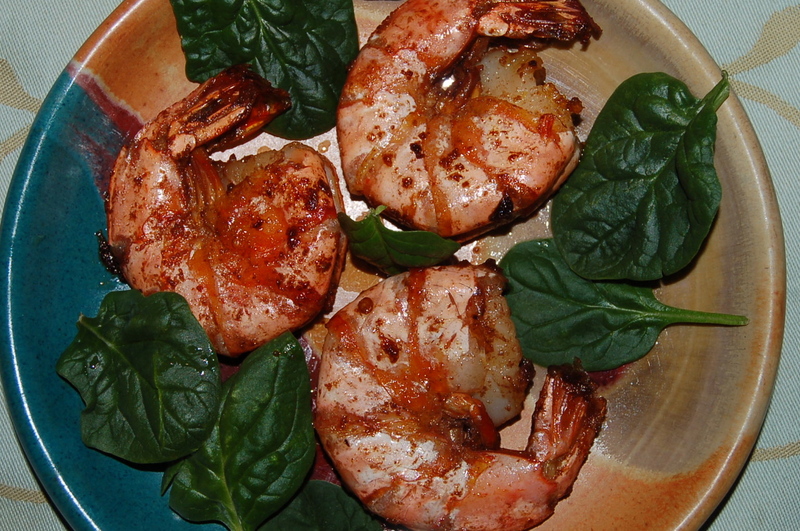 Here is a recipe I made up for Barbecued Winter Shrimp. I’m no food photographer but you get the idea. I use the 8/12 sized shrimp and since I was testing, I only thawed three for me. Thaw the shrimp in a bowl of water. Heat the oil, and two pastes over a very low heat in a cast iron frying pan, until the shrimp paste melts. I use a splatter guard, also. Add the shrimp, shells on! Cook over a very low heat about 30 minutes. When I say low, I mean you don’t hear the oil popping. Stir repeatedly, coating the shrimp with the reduced oil/paste sauce. Peel and cut up to serve over a bed of greens, or peel and eat whole with a crusty bread soaked in garlic olive oil and heated to 350°. This is very mild, if you want more spice, I would up the red chili paste. It is messy if eaten in the “peel and eat” method, but finger-licking good. This entry was posted in Cooking. Tagged cooking, Monadnock Oil & Vinegar Company, New Hampshire, olive oil, salad, shrimp, steak, vinegar. The shrimp sounds wonderful. Certainly a recipe I’ll have to try! Your salads sound gourmet and just the right thing for this time of year. I don’t think I’ve ever had poached pears. I see a new Food Chanel show on your horizon, Infused oil and balsamic creations with mama Schaef! These sound wonderful!!! it’s like you’ve become an overnight gourmet! Do the pears melt after being poached and frozen or do they stay firm? Hi Alan, the first batch were kind of mushy. Last night I tried a different recipe and the pears were firmer. I poached half in espresso balsamic and half in honey ginger. The espresso were really rich. The honey ginger stayed firm and were also good. I am having so much fun with this! Thanks for reading. Seems like best food for belly 😉 Loved it. Thanks Lala! I just went over to look at your blog. Great food posts and interesting reading. you must check the item before buying by reading the minor details. “In June of 2013, it absolutely was announced that Sean Parker will likely be investing $75 million in a very leading maker of electronic cigarettes.